The Social Work Student Research Community (SWSRC; formerly known as S.M.A.R.T.) was founded in 2010 to promote, develop, and sustain an environment in which Social Work students are afforded the opportunity to work together to apply theoretical foundations for research (taught in the classroom) to the real world. SWSRC is a cross-program (BSW, MSW, and PhD) community designed to provide opportunities for students to meet and discuss the various stages of research and research relevant topics, attend professional development workshops and Brown Bags, and collaborate with social work faculty. In other words, participate in a culture of learning that emphasizes the importance and value of research competence in the field of social work. Join our Canvas page to learn more about the Social Work Student Research Community, or contact Caitlin Brown, Manager of Research Support and Kendra Wells, Asst. Manager of Research Support. In spring of 2018, Student Research Intern, Kendra Wells presented findings on SWSRC engagement, which included recommendations on how to increase participation at the WSUSSW Student Research Symposium and won first prize for MSW poster presentation. She later presented at the 2018 Michigan Association for Evaluation Conference in Lansing, Michigan and won first prize for poster presentation. View her poster and more information about the 2018 MAE Conference here. In 2017-2018 over 230 students were members of the Social Work Student Research Community Canvas site, 23 unique students participated in meetings and events over the course of the year, and 6 students were matched with faculty. Learn more about Social Work students' involvement in Social Work research! 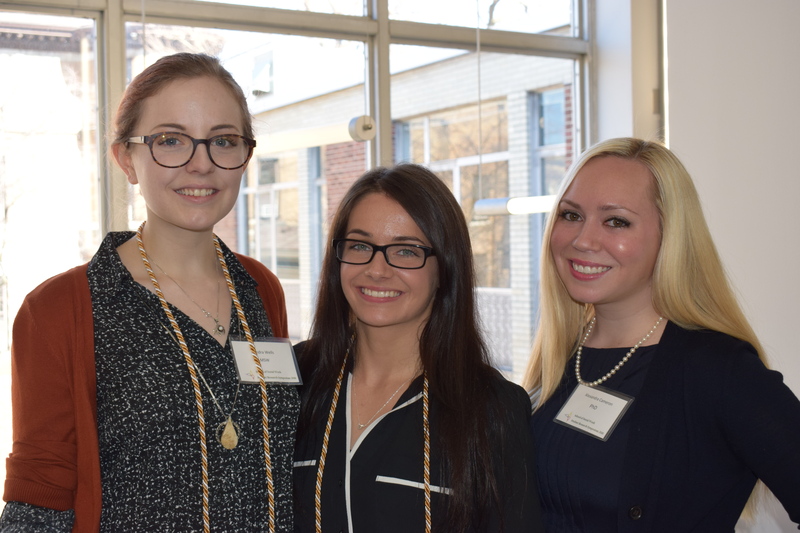 In April of 2018, the Center for Social Work Research held its first annual Student Research Symposium at the School of Social Work. BSW, MSW, and PhD students who either conducted their own research or assisted with a project were invited to share their findings in a poster presentation with social work faculty, staff, students, and other attendees. The objective of the Symposium was to connect research to social work practice and included a keynote address. Approximately 30 people attended, primarily social work students; 13 students participated. Wayne State University UROP (Undergraduate Research Opportunities Program) offers exciting avenues for undergraduate students to engage in research including hands-on research experience, grant funding opportunities, conference participation, and assistance finding research internships, training programs and faculty mentors. School of Social Work BSW student, Joseph Urbiel received a UROP award during Spring/Summer and Fall of 2017. Joseph worked with assistant professor Jamey Lister on a project titled, "Injection Opiod Use among Black Patients at an Urban Methadone Clinic: An Evaluation of Risk/Protective Factors to Injection Status."